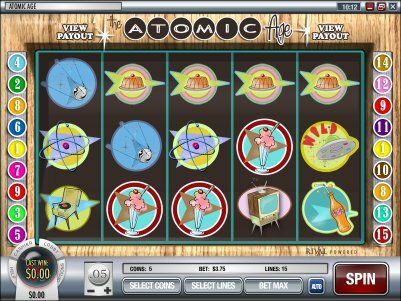 Overview: Atomic Age is a 5 reel, 15 payline Slot machine. Atomic Age has 2 Scatter Icons and one Wild Icon. The UFO Icon is wild. This icon will substitute for any other symbol to form winning combinations, other than the Scatter Icon. The Cashier Icon is a Scatter Icon. If 3 of these icons appear on the Reels you will be sent to the Cashier Bonus Round. These symbols do not need to appear in a sequence to trigger the bonus round as well you do not need to be playing all 15 Lines. It can be anywhere on any of the five reels. The Drive-In Icon is a Scatter Icon. If 3 of these icons appear on the Reels you will be sent to the Drive-In Round. These symbols do not need to appear in a sequence to trigger the bonus round as well you do not need to be playing all 15 Lines. It can be anywhere on any of the five reels. Note: You may wager on only 1 payline or multiple paylines up to a maximum of 15. Simply click on the Select Lines button to enable multiple paylines. You will only be paid on winning combinations for enabled paylines, except for the Scatter Icons which pay in any position. 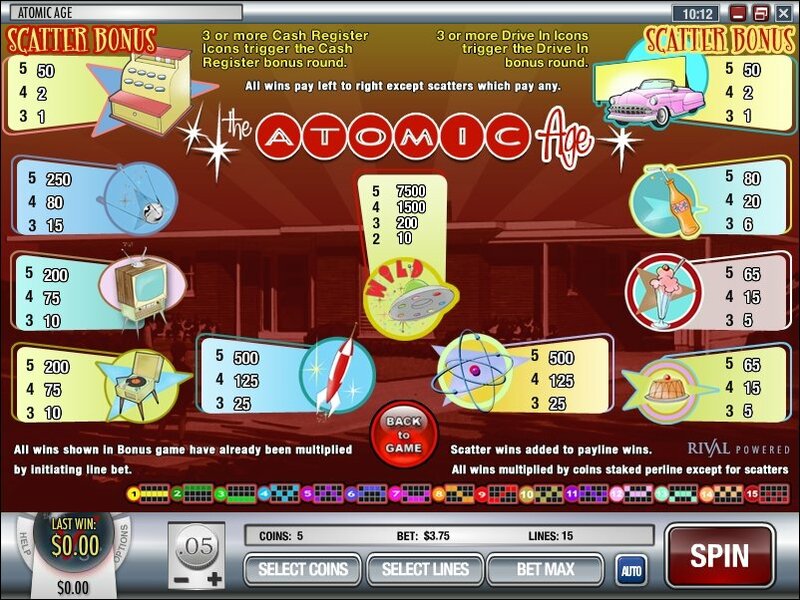 Similar Slots: If you like Atomic Age, you might like these other Rival video slot machines: Candy Cottage, Golden Gorilla, Metal Detector, Opera Night, Scary Rich 3, Shamrock Isle.